Sea Of Thieves is out ! After three years working on what is at that date the biggest project I ever worked on, Sea Of Thieves is now released. 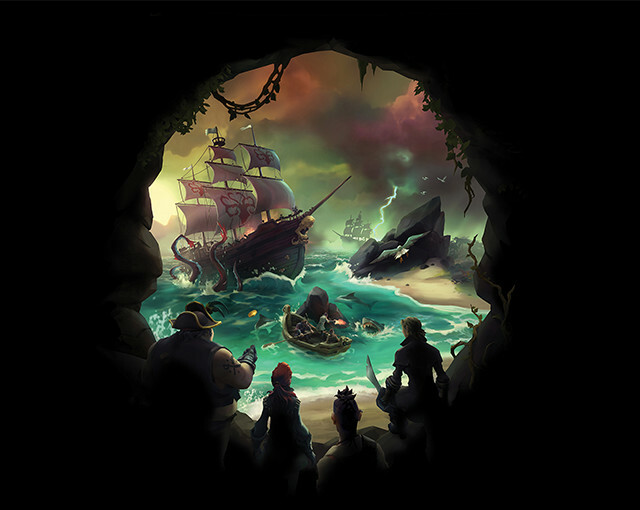 Sea of Thieves is a shared world action-adventure video game developed by Rare and published by Microsoft Studios for Microsoft Windows 10 and Xbox. The game allows players to take the role of a pirate, sailing the seas of a fantastical world either solo or as part of a crew of up to four players. The game features both co-operative and player versus player combat. Put down the controller and close your eyes: there is no better game on earth to listen to. What do I hear? The creak of timbers, the flap of a sail, the thud and shudder and boom of the ocean. So many of my very favourite things in Sea of Thieves are sounds. There’s the wonderful snug internal clonk of the ship’s wheel settling back into its full-ahead position (so subtle you have to really listen for it; at times I think I am imagining the whole thing). There’s the strained, buckling groan of your hull reacting to a dropped anchor when it still has sails filled with wind. Best of all there’s the neat, arresting, confirmative thwack of a shovel digging into sand and hitting – something! Something good! A treasure chest! Clonk, groan, thwack. This is a game you play with your ears as much as your eyes, and while your eyes get the glorious rolling, thrashing drama of the waters to look at, your ears get so much else besides. Your ears get the detailing that really sells the fiction.